I've been a gardener all my life and earned an MS degree in Botany from the University of Maryland. All of my previous experience and education did not help one bit when my husband and I moved to northeast Florida in 2004 and attempted to garden here. That first fall I planted 48 tulips in various parts of my yard to see where the best spots would be so I would know where to plant more the next year. The next spring only one leaf sprouted! One of my neighbors said that everyone knows to put them in the refrigerator for 6 weeks before planting. The next year I tried that, but they didn't do much better. So why do the stores even sell tulips here and how come the directions on the bulbs don't provide better guidance? The tulip lesson was only one of the many I experienced in my Florida gardening adventures. I figured that I was not the only transplanted gardener, so I opened my botany texts, bought some Florida-based books, joined the Florida Native Plant Society, and began to research Florida gardening. I started writing a more or less monthly column sharing our successes and failures. 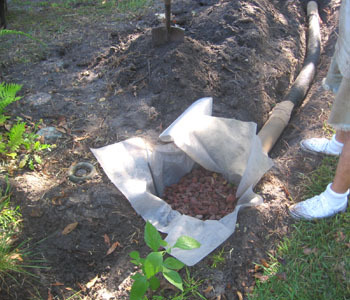 I posted these columns on my Adventures of a Transplanted Gardener website, in Jacksonville's newspaper, The Florida Times Union, and then on www.floridata.com, an online plant encyclopedia. Many of the columns have been picked up by other organizations such as master gardener newsletters and I've been writing a gardening column for Vero Beach Magazine. Now I'm one of the two main bloggers for The Florida Native Plant Society blog and on the team of bloggers for Native Plants & Wildlife Gardens blog. 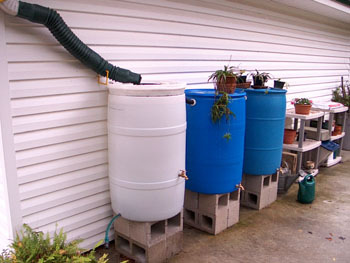 After writing two gardening books and living here for more than eight years, the transplanted gardener name didn't seem appropriate so I started a new blog: www.GreenGardeningMatters.com where I can discuss a broader range of topics. I've covered a wide range of topics over the years, but my columns are not armchair or ivory tower topics. 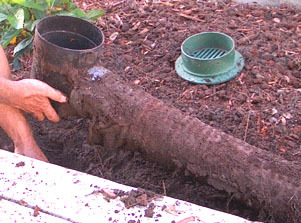 I'm out in my yard with dirt under my fingernails, testing techniques, and examining the results as I work to make our landscape more sustainable. 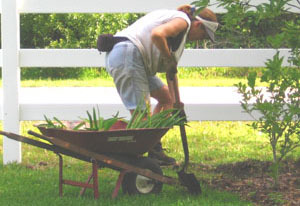 << I've written several articles on how I've reduced the size of our lawn by creating mulched beds around the trees and shrubs and also by allowing meadows to develop in several areas where grass did not do well. 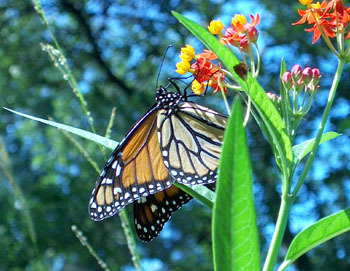 In order to attract the beautiful monarch butterflies, you need to provide food for their larvae. One of my favorite topics is creating habitat for wildlife. 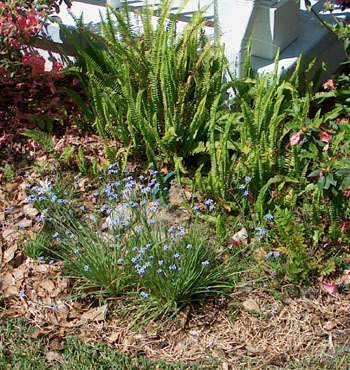 Habitat gardeners hope for a moth-eaten landscape. 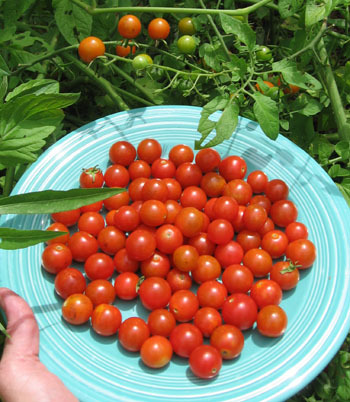 Be a locavore: grow some of your own food. My husband and I enjoy growing vegetables and cooking from the garden. Florida's mild winters means that cool weather crops such as lettuce and carrots are available from December through April. 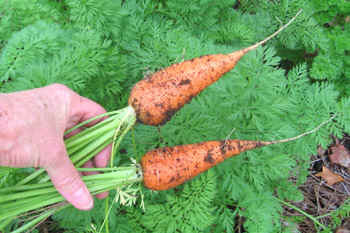 Warm weather crops usually have a long season or can have two crops. 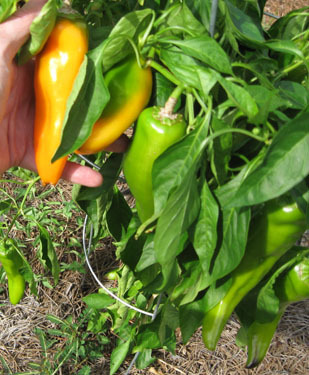 Now I'm writing a book on growing vegetables organically in Florida for University Press of Florida--I have a co-writer in Miami, because it's really different down there. << I don't shy away from gross topics. 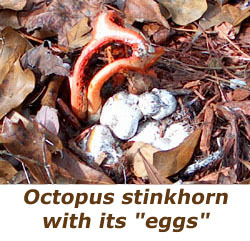 Stinkhorn fungi produce sickening odors to attract flies to spread their fowl spores far and wide. 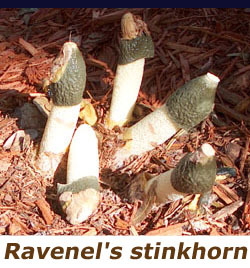 The Ravenel's stinkhorn smells like feces, while the octopus stinkhorn smells like carrion. Pee-eww! During the winter months these are some of my most-read columns. 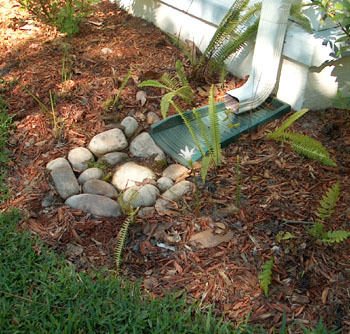 Rain gardens collect, filter, and absorb stormwater runoff, and thereby improving water quality of near by streams and rivers. I've written about the progress and expansion projects in our rain gardens. In March 2006, after hearing John Byram, editor and chief of University Press of Florida, talk about how The Press was always looking for topics related to Florida, I asked if he'd be interested in republishing a collection of my Transplanted Gardener columns. He declined, but asked if I'd write a book on organic gardening in Florida instead. (Update: see below. I finally wrote the book he wanted.) I agreed, but after more research on the topics involved in Florida gardening, my formal book proposal was for sustainable gardening instead of organic gardening because it is a larger topic with wider appeal. 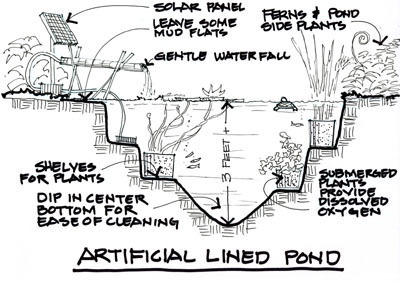 I worked with John Markowski, my friend, architect, artist, and gardener, to create clear line drawings to illustrate various topics for the book. The writing process included a great deal of research, using online and printed materials plus personal communication with various experts. Several rewrites with major changes were made with suggestions from experts hired by The Press, from my own contacts, and finally from the copy editor who is also a master gardener. At their meeting for the final approval of the book, the board at The Press surprised my editor and me with a request for color photos to be placed in an 8-page centerfold. There was not enough time to travel the state and take a whole year-long series of photos, no, I had to scan through my existing photos to find good, representative images portraying sustainability in the garden. Here's a link to the photos. While this has been a bigger project than I'd originally anticipated, I've had a wonderful time learning more about Florida, gardening, and writing. I hope that all this work will eventually have a positive impact on Florida and her ecosystems. But this is not the end of my learning about gardening in Florida, my adventures continue. Join me. 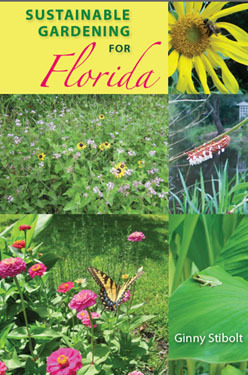 50% of royalties from the sales of this book will be paid directly to the Florida Chapter of The Nature Conservancy. When University Press of Florida asked me to write this book, I knew I would need a cowriter in south Florida because gardening there is so much different than here in north Florida. Not only is Miami four planting zones south, it also has a limestone substrate and hardly any soil and its rich Hispanic culture has influenced what is grown there. I met Melissa Contreras at Fairchild Tropical Gardens on the book tour for Sustainable Gardening for Florida. Her experience and background have been invaluable. 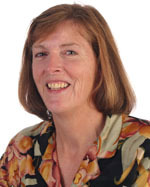 Marjorie Shropshire is our illustrator. Unlike most vegetable books, we arranged the veggies by plant family to make our writing more concise (We only had to explain about legumes and their nitrogen fixing bacteria once.) and to help gardeners better learn about crops rotation by family. 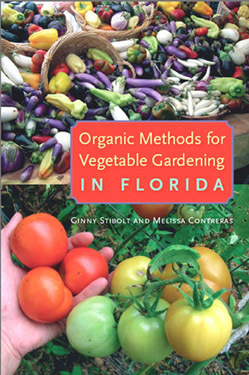 "Organic Methods for Vegetable Gardening in Florida" can be ordered from University Press of FL, Amazon, or your local book store.